My name is Katzi. I’m a Video Editor and Motion Graphics Artist by day and by night, I’m a crafter, wanderer, TV-watcher (I like to call that “research”), and a tarot reader! My journey into tarot has been very strange, I think. During a sleepover many moons ago, a friend and I played around with a Ouija Board. It was NOT a great experience. We were young. We didn’t know how to properly protect ourselves from malevolent things so we unknowingly invited them to “play” with us. Long story short, my experience with that Ouija Board put me off from anything “occult” for quite some time. I thought that Tarot was like the Ouija Board in the sense that it brought up spiritual contact and because I didn’t know how to properly protect myself, I decided Tarot wasn’t for me. Fast-forward to 2008. A really good friend of mine sent me to a wonderful Seer because I needed help on gaining some clarity of a few things. This Seer BLEW MY MIND with a Celtic Cross spread. She is a natural intuitive so she has no problems with predictive readings or Spirit Guide contact. She told me some very specific things that had very specific dates. My freewill saw to it that those things would not happen. With that, my view on the Tarot softened a little. The cards weren’t so scary after all! Fast-forward again to 2011. My friend and I were killing time on the boardwalk in Atlantic City, NJ while waiting for my flight home. I convinced her to pay the $25 for a little hole-in-the-wall psychic reading. She went first and really enjoyed it. Before I could hand the psychic her money for my reading, she asked me why certain things in my life had NOT happened yet. All the things the Seer told me would happen (from the 2008 reading) had made the Atlantic City psychic distraught because they had NOT happened. Mind you, I wasn’t even thinking about those things – I was thinking about my flight back home! I don’t remember what kind of spread she did for me but I remember there being no more than, say, 5-6 cards on the table. It’s safe to say that that really, really freaked me out. But I wanted to know more – especially about Tarot. Then in 2012-2013, it felt like I kept seeing the Three of Swords just about everywhere! What did I do to handle that? I bought a Rider-Waite-Smith deck at my local Barnes & Noble and read up on various ways to connect with my deck. 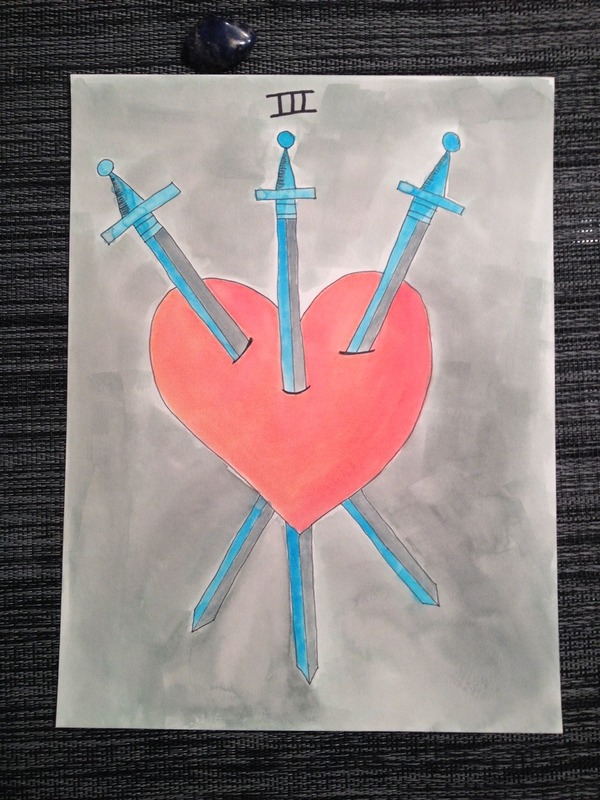 I slept with it under my pillow for months (because I liked it), pulled cards for people in my life to see what they “meant” to me (that’s where my love of the Aces of Cups happened) and finally, I painted a pretty low-key watercolor of the Three of Swords, just to get it out of my brain. I didn’t take it too seriously but a few experiments with a Celtic Cross spread yielded very startling results. It wasn’t until I was blog-jumping that I felt the need to get back into Tarot. The Four Queens, The Midheaven, Little Red Tarot, The Tarot Lady, and a few others made me want to learn more. I started The Four Queens’s Tarot Trainee course on YouTube and I’m thinking about starting Beth’s Alternative Tarot Course to get even more acquainted with my growing collection of cards. Joining the Alternative Tarot Network has really boosted my confidence as a reader and I feel like I have a proper place in this world. I love being part of such a wonderful group of people! I can’t wait to share more with you all here! This is a safe space and I want everyone to feel the love I feel when I’m with the cards. And I want to hear from you: questions, feedback, thoughts, comments…anything! What’s your Tarot story? I’d love to hear it! PS – I will be slowly importing my past readings from my Tumblr. After they have been brought over, I’ll be posting here and then sharing them to Tumblr 🙂 Feel free to follow me! So glad you commented on my blog and that your comments brought me here! I’m thoroughly enjoying your posts as I try and catch up with them, and love your energy! 🙂 Glad the universe allowed our planets to collide.